QCARBO PLUS WITH BOOSTER. Strawberry-Mango flavor. Designed as a stand-alone solution for heavy weight and frequent users, QCarbo Plus with Super Boost Tabs is the most reliable way to prepare for a urine drug screen. Designed as a stand-alone solution for heavy weight and frequent users, QCarbo Plus with Super Boost Tabs is the most reliable way to prepare for a urine drug screen. A fast cleansing liquid formula combined with concentrated detoxifying tablets makes QCarbo Plus a no nonsense solution for rapid detoxification. Effective in as little as 1 hour with maximum potency 2 hours after use, QCarbo Plus is fortified with a variety of nutrients to assist your body in flushing toxins on short notice. Each 20 oz. 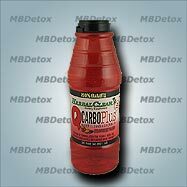 bottle of QCarbo Plus comes with a pack of 4 super boost tabs to increase the potency of your detox flush. A trusted name in fast detox, QCarbo Plus comes with a manufacturers money back guarantee. QCarbo Plus is available in Cran-Raspberry and Strawberry Mango flavors. Two hours before test time, drink 20 ounces of water. One and one half hours before test time, drink the entire bottle of QCarbo Plus with all 4 Super Boost Tabs. One hour before test time drink another 20 ounces of water. If you have not submitted a urine sample 2 hours after using QCarbo Plus, drink 8 ounces of water every hour to extend the effectiveness of your detox flush. We also recommend Pre-Tox Master Capsules as a preliminary cleanse prior to QCarbo Plus. This product is great asset to those who want to ensure their succes. For best results make sure you abstain from drug use for at least 2 days before testing. If at all possible abstain for longer. For light users 2 days of abstinence is enough to allow QCarbo to be effective. Heavy users will benefit and see improve test results if they can abstain for longer periods of time before testing. Remember, results are temporary lasting several hours with maximum potency 2 hours after use. When in doubt, try a complete FAST DETOX KIT.